You've invested considerable time and resources making your home spectacular, and it requires many systems to keep it running. An ESC Home Management System brings these systems together, offering you easy control of your whole living environment. Activate your entire home security system...Set the lighting & music for party mode...Prepare your home for vacation...all with a simple touch to the screen. No computer knowledge is necessary! While home automation is the traditional term for systems like ours, the use of automation has historically caused trouble for home owners. (For an excellent case study of the troubles caused by home automation, read this highly recommended and enlightening article.) In many cases where you may be thinking "home automation", you really just want a simpler way to manage, control, and live in your home. Our goal is to provide that simple management tool that lets you do just that — not to let your home control you with home automation! To reflect ESC's unique approach to controlling your home, you'll find we prefer and use the term "home management" instead of "home automation" throughout our site. 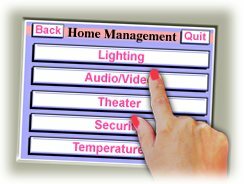 Many of the home automation goals that bring you to our site are best accomplished with an ESC Home Management System. Explore our site to find out more about this exciting way of living! This site was last updated on 10 March 2002.